Ubuntu Desktop 16.04 "Xenial Xerus"
Ubuntu is a free operating system that uses the Linux kernel. The word "ubuntu" is an old African word meaning "humanity." It is pronounced "oo-boon-too". It is one of the most popular Linux distributions and it is based on Debian Linux. The goal with Ubuntu is to make it easy to use and install onto a computer. Ubuntu can be used on all types of personal computers. Ubuntu is downloaded as a DVD, which is free to download on the Ubuntu website. It can be installed or tested by running the DVD. Started in 2004, Ubuntu has been developed very fast by Canonical Ltd., a company owned by a rich South African man named Mark Shuttleworth. Free software here includes only software that meets the Ubuntu licensing requirements, which almost are the same as the Debian Free Software Guidelines. There is one difference for the Main category, however — it has firmware and fonts which cannot be changed, but are included if Ubuntu will not work right. Non-free software is usually unsupported (Multiverse), but some exceptions (Restricted) are given for very important non-free software. Supported non-free software include device drivers that are needed to run Ubuntu on current hardware. The level of support in the Restricted category is less than that of Main, since the developers may not be able to get to the source code. It is wanted that Main and Restricted should contain all the software needed for a general-use Linux system. Besides the official repositories is Ubuntu Backports, which is an officially known project to backport newer software from later versions of Ubuntu. The repository is not comprehensive (meaning that it has parts missing from it); it is mostly made up of user-requested packages, which are accepted if they meet quality guidelines. Two new releases of Ubuntu are released each year, normally in April and October. The number of the Ubuntu release is 'X.YY', with 'X' being the year of release (minus 2000) and 'Y' being the month of release. For example, Ubuntu 4.10 was released in October (the tenth month of the year), 2004. The name of the release (for example, Breezy Badger) is an adjective (a describing word) followed by the name of an animal. 5.10 13 October 2005 Breezy Badger First "Edubuntu"
LTS indicates Long Term Support. Ubuntu's official software package repository includes, for example, UNetbootin. Kubuntu is an official variant of the Ubuntu distribution which uses KDE rather than GNOME. Because there are several options for which desktop environment to use, Ubuntu is available in many different variants. Ubuntu Server Edition, which is mainly used on servers to provide services. This version only comes with a command line interface, but a graphical user interface can be installed. ↑ Adam Conrad (18 April 2019). "Ubuntu 19.04 (Disco Dingo) released". Retrieved 2019-04-18. ↑ 2.0 2.1 "Supported Hardware". Official Ubuntu Documentation. Retrieved 7 July 2012. ↑ "Ubuntu 11.10 will support ARM processors to take on Red Hat". The Inquirer. 10 October 2011. Retrieved 20 October 2011. ↑ Paul, Ryan (26 April 2012). 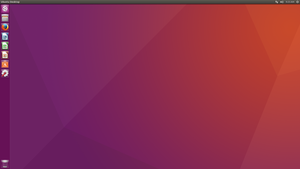 "Precise Pangolin rolls out: Ubuntu 12.04 released, introduces Unity HUD". Ars Technica. Condé Nast. Retrieved 7 July 2012. ↑ Larabel, Michael (23 January 2012). "Ubuntu's Already Making Plans For ARM In 2014, 2015". Phoronix. Retrieved 7 July 2012. ↑ Steven J. Vaughan-Nichols (22 August 2011). "Ubuntu Linux bets on the ARM server". ZDNet. Retrieved 20 October 2011. ↑ "uBuntu - Its Meaning". Ubuntu Peace Project. Retrieved 2008-12-14. ↑ Daniel Miessler (23 October 2007). "This is How You Pronounce Ubuntu". danielmiessler.com. Retrieved 13 March 2011. ↑ "Ubuntu naming system". Retrieved 2013-08-27. ↑ "Ubuntu 5.10 announcement". Retrieved 2008-08-18. ↑ "Ubuntu 5.10 release notes". Retrieved 2006-12-21. ↑ "Ubuntu 6.06 announcement". Retrieved 2008-08-18. ↑ "Ubuntu 6.06 release notes". Retrieved 2006-12-21. ↑ "Ubuntu 6.10 announcement". Retrieved 2008-08-18. ↑ "Ubuntu 6.10 release notes". Retrieved 2006-12-21. ↑ "Ubuntu 7.04 announcement". Retrieved 2008-08-18. ↑ "Ubuntu 8.10 Desktop Edition enables mobile, flexible computing for a changing digital world"
↑ "Ubuntu 13.10 (Saucy Salamander) released"
↑ Adam Conrad (17 April 2014). "Ubuntu 14.04 LTS (Trusty Tahr) released". Ubuntu Mailing Lists. Retrieved 22 May 2014. ↑ "Ubuntu 16.04 LTS (Xenial Xerus) released"
↑ ArchLinux.org, "Official repositories," excerpt, "A software repository is a storage location from which software packages may be retrieved and installed on a computer"; retrieved 2012-06-07. ↑ Unbuntu, Package unetbootin; retrieved 2012-06-07. Wikimedia Commons has media related to Ubuntu Linux. This page was last changed on 19 April 2019, at 02:55.